Together with the half cent, the large cent was one of two denominations to be struck at the Philadelphia Mint in the first year of regular coinage, 1793. 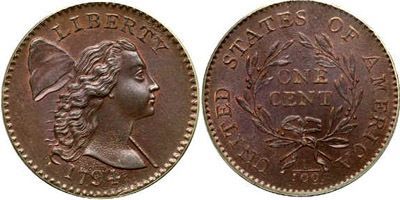 The term large cent did not come into use until after the late 18SOs, when a smaller cent was introduced, after which there was reason to compare. Released in March 1793, the Chain-type large cent was the first regular issue coin to be produced at the Mint. Its authorization, as well as that for all initial denominations, came on April 2, 1792, but because Congress required security bonds to be posted before Mint officials could handle gold and silver bullion, there was a delay in production of almost all authorized denominations (with the exception of the 1792 half dime, struck on a privately owned press using silver supplied by President Washington). Except for the half dime, half cent, and cent, no denominations were produced for regular issue until 1794 and 1795. Large cents were produced continuously from 1793 to 1857, with the solitary exception of the year 1815. More populous than the smaller half cents, the copper one-cent pieces were widely seen in the channels of commerce, but only in the northeastern section of the <?xml:namespace prefix = st1 ns = "urn:schemas-microsoft-com:office:smarttags" />United States. So far as can be determined, such coins circulated extensively only as far west as Illinois and Michigan and about as far south as Virginia. <?xml:namespace prefix = o ns = "urn:schemas-microsoft-com:office:office" />Cents of the year 1794 are favorites with numismatists. Several dozen different varieties were produced, one of which, the Starred Reverse, remains a numismatic enigma. Around the reverse border denticles are 94 tiny five-pointed stars. The curiosity, chronicled by Dr. William H. Sheldon in his landmark reference on cents of the years 1793-1814, Penny Whimsy, designated this as variety S-48. Opinion is divided concerning the origin of the piece. Don Taxay described it as a pattern, while Dr. Sheldon was inclined toward the view that it was just a curiosity, the result of a whim by an engraver during an idle hour at the Mint. Whatever its origin or intent the Starred Reverse is the most famous cent of the year. In the late 19th century Dr. Edward Maris used his knowledge of Latin and medicine to give 1794 cents, which he studied in detail, such names as Ornate, Venus Marina, and Shielded Hair, to mention just a few. One early cent die is known to collectors as the Office Boy Reverse, presumably because no regular engraver could have produced such an amateurish job. Fanciful description given to cents of 1794 and other early years has heightened their appeal. The Early American Coppers Club publishes Penny-Wise, a journal devoted to the rarity, prices, and idiosyncrasies of 1794 cents and other early copper issues, particularly of the 1793-1814 era. In 1795 numerous die varieties were produced. Interesting among them are the reeded edge cent, whose origin and purpose are unexplained, and the so-called Jefferson Head, presumed to have been a pattern issued by John Harper, a saw maker, who supplied material to the Mint at various intervals during the period and who actively solicited a contract for private coinage. The uncertain supply of copper remained a problem which was not solved until regular shipments of prepared planchets (complete with raised rims) were received from Boulton & Watt, of Birmingham, England, toward the end of the decade. Previous to that time copper was of irregular quality. Supplies from certain sources were coarse and discolored. This accounts for the wide variation of metallic surfaces observed on early copper coins of the period. The Liberty Cap design, in use since 1793, was discontinued part way through 1796 in favor of Robert Scot's Draped Bust design, a style which was subsequently utilized through 1807. Within this period are to be found many different die variations, including such errors as the 1796 LIHERTY, several varieties lacking stems to the reverse wreaths, and one famous blundered die, the so-called Three Errors Reverse, which lacks one wreath stem, has the mathematically meaningless fraction 1/000 (instead of 1/100), and has UNITED spelled as IINITED. The rarest date in the large cent series, the 1799, is also of the draped bust style. A search for a cent of his birth date, 1799, led 17-year-old Joseph J. Mickley to learn more about coins. Later he was to become the most prominent American numismatist of the early 19th century. The 1804 cent, also of the draped bust style, is remarkable for its rarity. An interesting variety of the 1804 cent was made around the year 1860. Known as the "restrike," the piece should more properly be termed the creation, for a restrike implies a later use of something that was earlier produced. In the present instance, the die combination used to make the 1804 restrike was never employed for circulating coinage. The obverse die, dated 1804, was crafted by altering an 1803 cent die. The reverse die was originally used on a cent of 1820 and is stylistically much different from that used on an original 1804 (the 1820 reverse has a continuous wreath without an opening at the tope, whereas the 1804 wreath is open). Although not much is known about the actual circumstances surrounding the issue of this famous "restrike," it probably was produced from dies sold as "scrap iron" by the United States Mint during the 1850s. For a number of years this piece was catalogued as the "Mint Restrike," for specimens evidently were first sold by employees at the Philadelphia Mint, or perhaps they emanated from private sources in the same city. Considering the rusted state of the dies and also the surface similarities of the 1804 issue to other restrikes from discarded dies (such as the 1811 restrike half cent with the reverse of 1802, and the 1827 restrike quarter) it seems doubtful that this venerable minting institution was indeed the source. Such a production would have been the cause of embarrassment and would have directed unfavorable attention to Mint activities (as it was, the Mint was indeed producing restrikes, but care was taken to use dies that were excellently preserved, not rusted!). Today the 1804 "restrike" is avidly collected as an interesting curiosity of the period. In 1808 Reich's classic head style was adopted. Coinage continued through 1814, when lack of copper planchets forced suspension. Cents from this era are often weakly struck and are on planchets which discolored easily. In 1816 Robert Scot redesigned the cent. Miss Liberty appeared with a coronet on which the word LIBERTY was inscribed. With several variations, this style was continued until 1839, at which time it was superseded by Gobrecht's braided hair style. The braided hair motif, also with several variations, continued through 1857. Cents of the later years were chronicled by Howard R. Newcomb in United States Copper Cents 1816-1857, published in 1944. Scarce dates among later cents include the 1821, 1823, and 1857. 1839 saw the production of several different distinct varieties: the Head of 1838, the Head of 1840 (braided hair style), and the curiously-named Silly Head and Booby Head. In 1849 the Committee of Ways and Means advised Robert Maskell Patterson, director of the Mint, that it was studying the reduction of the size of the one-cent piece. In 1850, the following year, the Mint produced several patterns. Struck in billon (an alloy of 90% copper and 10% silver) and copper, the pieces had holes at the center in the manner of Chinese coins. The diameter approximated that of a dime. In 1851 additional patterns were made of the so-called annular, or ring, cent. The cumbersome large cent was finding increasing disfavor with the public, and many complaints were registered with the Mint and government officials. In 1853 patterns containing nickel and copper in various alloy mixtures were produced. It was believed that nickel, being valued at $2 per pound, would permit a smaller diameter coin to be made with the intrinsic value remaining sufficiently high. The following year, 1854, saw the production of additional patterns. Made in copper and related alloys, the pieces depicted various designs including Liberty Seated (crudely reduced on a pantograph lathe from the obverse of an 1854 silver dollar), a Liberty Head style similar to that used on regular issue large cents but without stars, and a flying eagle design resurrected from Gobrecht's pattern silver coins of 1836-1839. In 1855 additional flying eagle patterns were made. As experimentation continued, demand for the abandonment of the old-style copper cent increased. James Ross Snowden reported that by 1857 the production of large copper cents and half cents barely paid the coinage expenses involved. The Act of February 21, 1857, provided that a new standard be adopted and thus sounded the death knell for the old-type coppers. The public was urged to redeem all cents of the old standard. Within a few years large cents became curiosities. 1793 Chain AMERI. The first U.S. cent variety. Most examples known are in lower grade ranges. A Mint State coin is worth $100,000 or more. 1793 Chain AMERICA. Produced in several varieties. 1793 Wreath. The most often seen type of 1793, but still rare. 1793 Strawberry Leaf. Wreath type, but with a "strawberry leaf" above the date. only a few are known, and these are well worn. Value: $100,000 or more. 1793 Liberty Cap. Very elusive in all grades. 1794 Starred Reverse. Only a few dozen are known. The finest is VF-35 to EF-40 and is valued at over $100,000. 1799 This is the rarest date in the large cent series. VF and EF coins have sold for $10,000 to $25,000 or so. 1804 Rarest 19th century large cent date. 1824: In 1824, large cents of various dates, primarily 1816-1823, were counterstamped privately with dies depicting the head of George Washington on the obverse and Lafayette on the reverse. The occasion was the return to America in 1824 of Lafayette, the French hero of the American revolution. Congress designated him as "the nation's guest." Such counterstamped coins are very rare today, and fewer than 20 are believed to exist (other coins, including half dollars, were also counterstamped). 1839/6 Overdate. Rare. Nearly all known specimens are in worn grades, Good to VF. Breen, Walter H. and Mark Borckardt. Encyclopedia of U.S. Large Cents 1793-1814 (working title); manuscript based upon the research of the late Walter H. Breen, now being updated, expanded, and edited by Mark Borckardt4 Publication date not yet announced. Newcomb, Howard R. United States Copper Cents 1816-1857. New York: Stack's, 1944; plus later reprints. The standard classic work on the series. Today, coins of 1816-1857 are attributed by Newcomb numbers. Noyes, William C. United States Large Cents 1793-1814. Bloomington, MN: 1991. Contains photographs of coins from the Naftzger Collection. A valuable guide to attributing varieties. Noyes, William C. United States Large Cents 1816-1857. Bloomington, MN: 1991. Contains photographs of coins from the Naftzger Collection. A valuable guide to attributing varieties. Penny-Wise. Official publication of the Early American Coppers Club. Harry Salyards, M.D., editor. A fine journal filled with much information. Highly recommended! Sheldon, William H. Early American Cents. New York: Harper, 1949. Today, coins of 1793-1814 are attributed by Sheldon numbers. Sheldon, William H., Dorothy I. Paschal, and Walter H. Breen. Penny Whimsy. Rockville Centre, NY: Ford Numismatic Publications, 1958; plus later editions. An updating of Early American Cents, by Dr. William H. Sheldon. The essential reference for the 1793-1857 series. Adams, John W., ed. Monographs on Varieties of United States Large Cents 1793-1794. Lawrence, Massachusetts: Quarterman Publications, 1976. American State Papers - Finance. Vols. I and II. Washington, D.C.: Gales & Seaton. 1832-61. Bowers and Ruddy Galleries, Inc. The Celebrated John W. Adams Collection of United States Large Cents of the Year 1794. Los Angeles: Bowers and Ruddy Galleries, Inc., 1982. Breen, Walter H. The United States Patterns of 1792 and Minor Coinages of the Philadel Mint 1793-1916. Coin Collector's Journal, nos. 154 and 155. 1954. Chapman, Samuel Hudson. The United States Cents of the Year 1794. Philadelphia: the author, 1923; Second edition, 1926. Clapp, George H. The United States Cents of the Years 1798-1799. Sewickley, Pennsylvania: the author, 1931. --- The United States Cents, 1804-1814. Coin Collector's Journal, Vol. 1, no. 9 (Dec. 1934). Clapp, George H. and Howard R. Newcomb. The United States Cents of the Years 1795, 1796, 1797 and 1800. New York: The American Numismatic Society, 1947. Crosby, Sylvester Sage. The United States Coinage of 1793 - Cents and Half Cents. Descriptions of the Various Dies Bearing That Date, With Notes on the Establishment of the Mint. Boston: The author, 1897. Dickeson, Dr. Montroville Wilson. American Numismatical Manual. Philadelphia: J.B. Lippincott, 1859; this was followed by two later editions, 1860 and 1865. Doughty, Francis Worcester. The Cents of the United States: A Numismatic Study. Extensively Illustrated from Selected Specimens. New York: Scott Stamp & Coin Co., 1890. Various reprints. Eckfeldt, Jacob Reese and William Ewing DuBois. A Manual of Gold and Silver Coins of All Nations, Struck Within the Past Century. Philadelphia: Assay Office of the Mint, 1842; supplement, 1849. Elder, Thomas L. The Varieties of the United States Cents of 1796. New York: The author, 1909. With two phototype plates. Frossard, Edouard. Monograph of United States Cents and Half Cents, Issued Between the Years 1793 and 1857. Irvington, NY: the author, 1879; only 300 printed. Frossard, Edouard and William Wallace Hays, Esq. Varieties of the United States Cents the Year 1794. New York: privately printed, 1893. --- Varieties of United States Cents of the Year 1794, Described and Illustrated. New York: Elder Numismatic Press, 1910. Preface dated Oct. 7, 1910. "Illustrated from the magnificent cent collection of E. Gilbert, Esq., of New York City, and reprinted, with additional numbers, by Thos. L. Elder of N.Y. City." 300 copies. 4 plates. Hickcox, John H. Hickcox. History of American Coinage. Albany, N.Y.: Joel Munsell. 1858. only 200 copies printed. Julian, Robert W. "British Planchets and Yellow Fever". Numismatic Scrapbook Magazine, June 1975, pp. 36-44. ---"Cent Coinage of 1794-1795." Numismatic Scrapbook Magazine, January 1975, pp. 6-17, 30. ---"Cent Coinage of 1796." Numismatic Scrapbook Magazine, March 1975, pp. 6-17. ---"Cent Coinage of 1797." Numismatic Scrapbook Magazine, April 1975, pp. 84-93. ---"Cent Coinage of 1800." Coin World, 7 July 1976, p. 32. ---"Cent Coinage of 1801." Coin World, 1 December 1976, p. 32. ---"Cent Coinage of 1802." Coin World, 6 April 1977, p. ??. ---"Cent Coinage of 1803." Coin World, 4 May 1977, p. 46. ---"Die Steel Shortage Plagues Coiner." Numismatic Scrapbook Magazine, October 1973, pp. 884 ff. --- "From Shortage to Surfeit: The Coinage of 1799." Numismatic Scrapbook Magazine, August 1975, pp. 32-33, 90-95. ---"The 1796 Copper Coinage." Numismatic Scrapbook Magazine, October 1965, pp. 2714-22. --- "The Beginning of Coinage - 1793." Numismatic Scrapbook Magazine, May 1963, pp. 1359-64. --- "The Cent Coinage of 1793." Numismatic Scrapbook Magazine, December 1974, pp. 60-68. --- "The Copper Coinage of 1794." Numismatic Scrapbook Magazine, March 1963, pp. 949-51. ---"The Copper Coinage of 1795." Numismatic Scrapbook Magazine, December 1964, pp. 3294-97. --- "The Davy Report on Copper Coinage." Numismatic Scrapbook Magazine, May 1964, pp. 1506-09. --- "The Harper Cents." Numismatic Scrapbook Magazine, September 1964, pp. 2370-74. ---"The Mint in 1792." Numismatic Scrapbook Magazine, April 1962, pp. 124-148. ---"The Mint Investigation of 1795." Numismatic Scrapbook Magazine, July 1961, pp. 1713-20. ---"The Patterns of 1792." Numismatic Scrapbook Magazine, June 1962, pp. 1836-42. Lapp, Warren A. and Herbert A. Silberman, ed. United States Large Cents 1793-1857. Lawrence, Massachusetts: Quarterman Publications, 1975. Levick, Joseph N.T. "A Table Exhibiting The Prices Paid For The Five Types of the 1793 Cent of the United States..." American Journal of Numismatics, October 1868, pp. 47-48 Levick, Joseph N.T. and Sylvester Sage Crosby. "The United States Cents of 1793. Illustrated by the famous Levick Plate." American Journal of Numismatics, April 1869, pp. 93-97. Maris, Dr. Edward. Varieties of the Copper Issues of the United States Mint in the Yea Philadelphia: William K. Bellows, 1869, preface dated Sixth Mo. 5th (June 5); Second edition, 1870, describing four more cent varieties. McGirk, Dr. Charles E. "United States Cents and Die Varieties 1793-1857.11 The Numismatist, April 1913 - September 1914. Supplementary tables appeared in the October-December 1914 issues. An 18-part serial of tabular descriptions. Newcomb, Howard Rounds. The United States Cents of the Years 1801-1802-1803. Detroit: the author, 1925. Newcomb, in 1931, issued two supplementary plates describing new varieties. Snowden, James Ross. A Description of Ancient and Modern Coins in the Cabinet Collection at the Mint of the United States. Philadelphia: J.B. Lippincott, 1860.